First, aperture of F1.5 is not comparable to aperture in traditional camera lenses(like on mirrorless or DSLR) and in my testing, Galaxy S9 Plus F1.5 did not give much more bokeh over Pixel 2’x F1.8 aperture. That was very disappointing since that would be one of the biggest reasons to get the Galaxy S9/S9 Plus. Also with wider aperture of F1.5 should give clear improvement in low light but in my testing, the Pixel 2 XL actually outperformed the S9 Plus in most low-light conditions, especially where there were a lot of background lights such as street lighting. Also, I found focusing was actually much better in low-light with Pixel 2 XL while S9 Plus had trouble at times focusing. While on paper F1.5 sounds like a dream come true, my testings prove that smartphones are not like regular camera lenses as they are much smaller and having wider aperture does automatically equal better photos in low light or more bokeh. Now, Galaxy S9 Plus still is an excellent camera, I am just saying it falls short of Pixel 2’s HDR+ camera processing, which makes up for its F1.8 with excellent software post-processing. Of course, the Galaxy S9/S9+ could also perform just as well using the Google HDR Camera APK(but currently does not support the new S9) and I will have an update when that is doable. This also probably means that S9/S9+ camera hasn’t really improved too much over last year’s S8/S8+(but I will have an update on that too soon), and for those of you upgrading from S8/S8+, might be better to hold off until Galaxy S10/S10+ comes out next year. 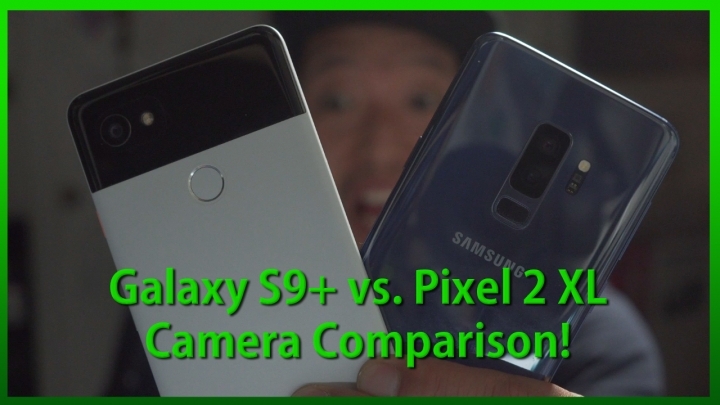 Download Galaxy S9 Plus & Pixel 2 XL original photos used in video. CORRECTION: The initial test using F1.5 during the day was really the test for bokeh since F2.4 will obviously not compete against F1.8 on Pixel 2 XL. Sorry, I should have not tested for exposure since S9+ Pro mode doesn’t have HDR enabled, see part II for comparison using Auto/HDR modes.